¶ Now we get to the nitty gritty, and the only things you really need to know. All the bolt torque guides are just that, guides. Most all of them are torque figures for clean dry threads. Well, I don't use dry threads. On all threads that use a torque of ten Foot Pounds and under I Oil them with a light weight oil. I use a low temperature snowmobile oil. On all bolts with a called for torque of fifteen Foot Pounds or more, I use a Molybdenum Disulfide grease. I then torque to the figure given in the shop manual. You will find that the torque, for almost every bolt and nut on your motorcycle, is given in the shop manual. Why do I do this? Well, I have had, at one time, head gasket failures. After I started using the Molyendeum Disulfide grease... no more blown head gaskets. I got the idea for the grease from a Honda GL1000 shop manual which said to use it on the head bolt threads. I think Honda was right. The oil and the grease make the bolts turn easier. This seems to make things clamp down better. Some may say that we are increasing the torque on the bolt and theoretically they would be right but, I have had excellent results doing this. Lubrication makes assembly and DISASSEMBLY much easier. You have got to remember... sooner or later, this turkey has got to come apart again. Interestingly, I just read an article, in a major motorcycle magazine, on lubing spark plug threads with anti-seize. Some guy wrote in to ask if the using anti-seize on spark plug threads changed the torque reading. Seems a spark plug manufacturer said to cut torque by one half if you used anti-seize. The guy writing the article checked with several other spark plug manufacturers and all of them seemed to think that was a bad idea. I agree. His sources said to torque the plug to the lower end of the recommended setting, when using anti-seize. This I can live with. 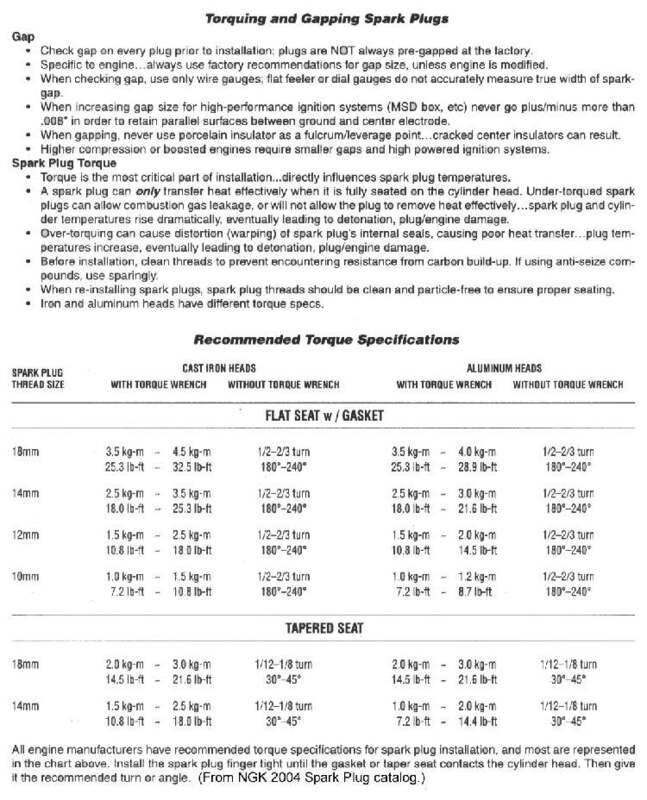 Here is a chart from NGK on Spark Plug torque, and as a PDF file. This got me to thinking. 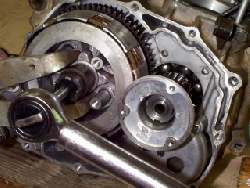 Does lube change the torque significantly? I took a ten millimeter, grade 8.8, 1.25 thread, bolt, then put a spacer and nut on it. With the nut loose I measured the over all length of the bolt. I then torqued it to thirty five foot pounds with a torque wrench. Then I measured the it again. 3.022" to start. Then 3.026" after torquing, so we have .004" bolt stretch. Doing the same thing with the bolt threads lubricated with Molybdenum Disulfide grease. The bolt stretched to 3.027". So lubed, we have .005" stretch. That's about a 20% increase. Now, consider some other things. I was surprised to find that getting an accurate, repeatable measurement was quite difficult. Things, they kept a'changen ! I also am not really sure how much of a torque increase that extra .001" in bolt stretch really is. This sounds like a great experiment and I'm sure the next time I have five or ten extra free hours with nothing to do, I will look into it ! Till then it's oil for threads with ten foot pounds of torque and below, Molybdenum Disulfide grease for threads with above ten foot pounds of torque, and anti-seize for spark plug threads. If the shop manual for your engine gives a different procedure, I would follow it, but if all it gives is a torque figure I would lubricate that thread ! Interestingly enough, all the tests I've read indicate it's much better to slightly over torque a bolt then to under torque it. Anyway, that's what I do. Oil or Grease up the threads and torque to the right amount for that size and grade of bolt. Contrary to what you might think, this lubrication will not make the bolt loosen and fall out. Engine vibration or a poor design does that. Remember, a correctly torqued, threaded fastener of the right type, used in a properly engineered assembly, will not come loose... most times, anyway. I made up a chart of Bolt Torques for US and Metric bolts. 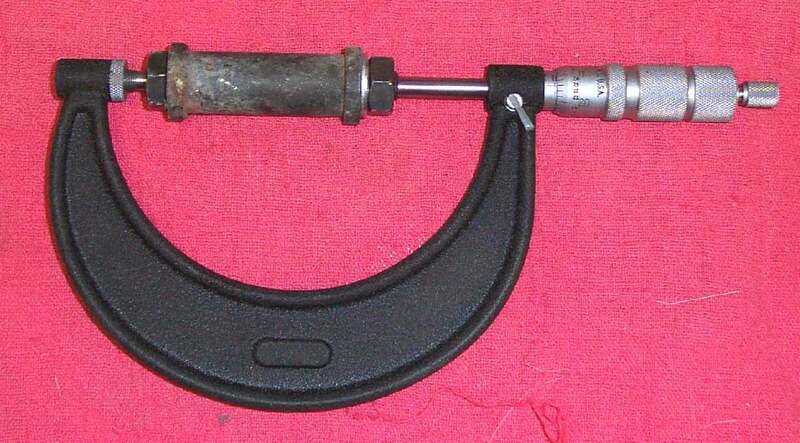 I was surprised to find that while US bolt torques seem to be quite standardized, the Metric ones were all over the place. Huge differences, depending on what book you looked in. I never realized this before because I always use the Torque Values given in the Shop Manual for whatever machine I was working on. My advice is to use your Shop Manual. But you want a chart too, don't you. Here it is as a PDF file too. I still say USE YOUR SHOP MANUAL! If a bolt keeps coming loose you might have to remove the flat washer that is under the lock washer. 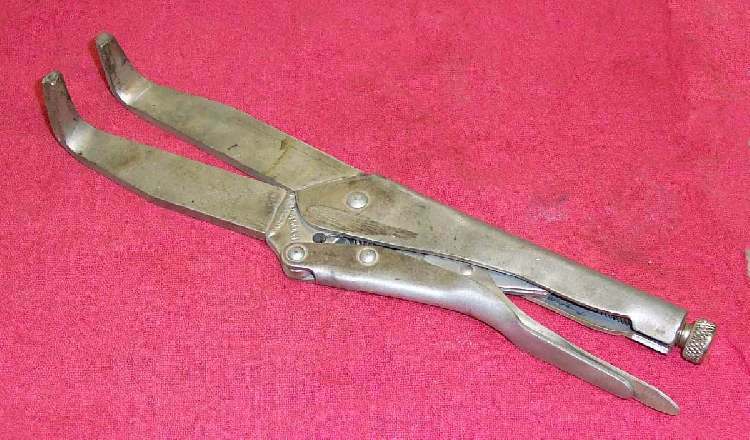 It will also help if you tighten the bolt and then take a hammer and continue to tighten the bolt just a bit with several sharp blows. You are only trying to tighten the bolt, or nut, just a little bit. The important thing is to do it with a sharp rap or two. This tends to lock the bolt in. I don't know the reasons why it works but I can tell you that it does work. Lots of racers rely on safety wired bolts and nuts to keep things together. The nut or bolt is drilled and wired in such a way that it is physically impossible for the fastener to loosen. My thanks to Flanders Co. for letting me use this chart from their catalog. Fortunately, these days we also have another trick to keep those bolts together. It's called Chemical Thread Locker. There are a number of different manufacturers but they all seem to have a low strength type, a medium strength type, a high strength type, and sometimes a ultra high strength, stud locker, type. I usually use the low strength type for very small bolts and the medium strength for most everything else, especially on disk brake bolts. Use it anywhere there's a bolt you don't want to come loose. Here it can really pay to check the shop manual. Some bikes use all the different strengths of thread locker on various bolts on the motorcycle. Check your shop manual. We have another little problem torquing bolts and nuts. Everything tends to turn. When you torque a crank nut, the crank wants to turn too. Same with a clutch nut. There are a number of ways to lock whatever shaft you are trying to torque. 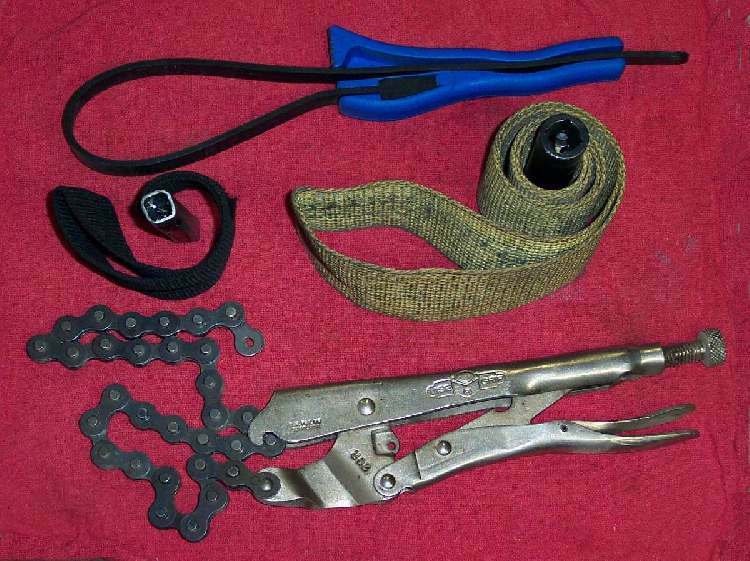 A strap wrench works well on flywheels or anywhere you have a large roundish something to wrap it around. A penny works if you jam it between two gears. The penny is made of soft metal and doesn't harm the gears, but it's not my favorite way to do it as I have seen the penny go right through the gears. You wouldn't think that would be possible, but it did happen to me more than once ! A better method is a Grabbit tool. They work great, however you do need to make sure whatever you grab with it is strong enough to take the strain. For locking cranks I like to use two square shaft screwdrivers and the wrist pin and rod. This way, prevents damage to the crankcases and rod. If the cylinder head is on you can put some cotton rope down the spark plug hole. When the piston comes up, it will jam the rope in the head and lock the crank. When it's torqued, turn the crank the opposite direction and pull the rope out. If any little piece of the cotton rope gets cut and left in the cylinder it will burn up and go away. You can also use the rear brakes to lock the engine shafts if the engine is still in the frame. Use your imagination. Just make sure the parts you hold, to lock the shafts, are strong enough to handle the torque.